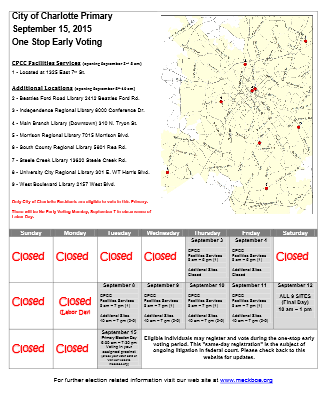 (September 4, 2015) One stop early voting for the 2015 Primary begins at the Steele Creek Library (13620 Steele Creek Road) on Tuesday, September 8 and continues through Saturday, September 12. Hours are 10:00 AM to 7:00 PM on Monday through Friday and from 10:00 AM to 1:00 PM on Saturday. Click HERE or on the image below to view a list and map of the other eight early voting locations in Mecklenburg County. Voters will not be required to show identification until the 2016 elections. Eligible individuals may register to vote during the early voting period. Although the North Carolina General Assembly eliminated same day registrations, this and other provisions of 2013 legislation that tend to limit voting opportunities are subject to ongoing litigation in federal court. Only Charlotte voters may vote in the primary, which includes elections for Charlotte mayor and for at-large and district city council seats. All Mecklenburg County voters may vote in the election for Charlotte-Mecklenburg School Board at-large seats that will occur in November. Voters who do not participate in early voting can vote at their precincts during the primary voting on Tuesday, September 15. 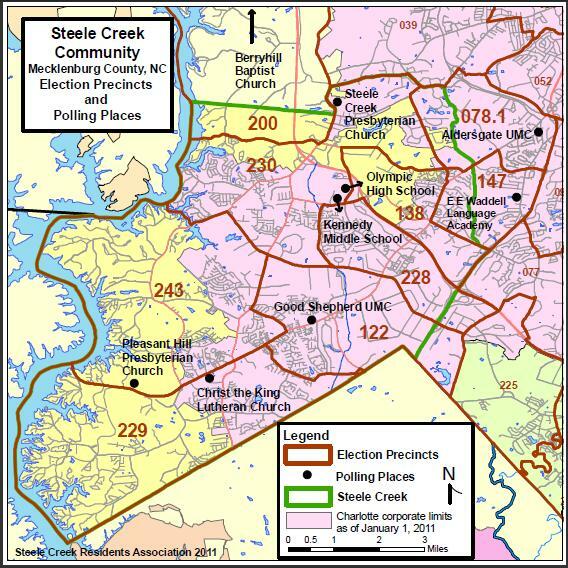 Steele Creek voters who reside within the Charlotte city limits will have three offices in the Democratic primary and one in the Republican primary. If necessary, the second, runoff primary will be on October 6. Primary winners will face off in the General Election on November 3. Democrats will choose from six candidates for Mayor of Charlotte in the primary: Michael D. Barnes, Daniel (Dan) Clodfelter (Incumbent), Roderick Davis, David L. Howard, DeJawon Joseph, and Jennifer Roberts. Republicans will choose from two candidates for Mayor of Charlotte in the primary: Edwin B. Peacock III and Scott Stone. Democrats also will narrow the field of candidates for at-large seats on the Charlotte City Council from twelve to four in the primary. Candidates in the Democratic primary are Lawrence E. Bibbs, Darrell Bonapart, Bruce Clark, Julie Eiselt, Claire Green Fallon (Incumbent), Sean Gautam, Shawn Greeson, Mo Idlibby, Vi Lyles (Incumbent), Billy D. Maddalon, James (Smuggie) Mitchell, and Aaron Sanders. Republicans will not have a primary for at-large seats on the Charlotte City Council. The three candidates who will be on the November 3 General Election ballot are Pablo Carvajal, John K. Powell, Jr., and David Michael Rice. All of the parts of Steele Creek within the Charlotte city limits are within Charlotte City Council District 3. Democrats will choose from three candidates: Rosa Hodge-Mustafa, LaWana Mayfield (Incumbent), and Warren F. Turner. Republicans will not have a primary for District 3. Eric Wayne Netter will be the Republican candidate on the November 3 General Election ballot. School Board District and at-large representatives are elected every two years on a rotating schedule. All members serve four-year terms. The six District representatives were chosen in the November 2013 election. The three at-large representatives are up for election in 2015. School Board elections are non-partisan and will occur on Election Day, November 3. The nine candidates for the three seats are Angela Ambroise, Janeen Bryant, Larry Bumgarner, Elyse Dashew, Erica Ellis-Stewart (Incumbent), Levester Flowers, Mary T. McCray (Incumbent), Jeremy Stephenson, and Amelia Stinson-Wesley. The map above shows election precinct boundaries, numbers, and polling locations in Steele Creek. See maps of election districts in Steele Creek on the following page: Election Districts in Steele Creek. To verify your registration status, view sample ballots, and for more information about the 2015 Primary and General Election in Mecklenburg County, see Mecklenburg County Board of Elections.